2019 T Shirts on SALE now!! Also look for our Clearance 2018 Shirts! 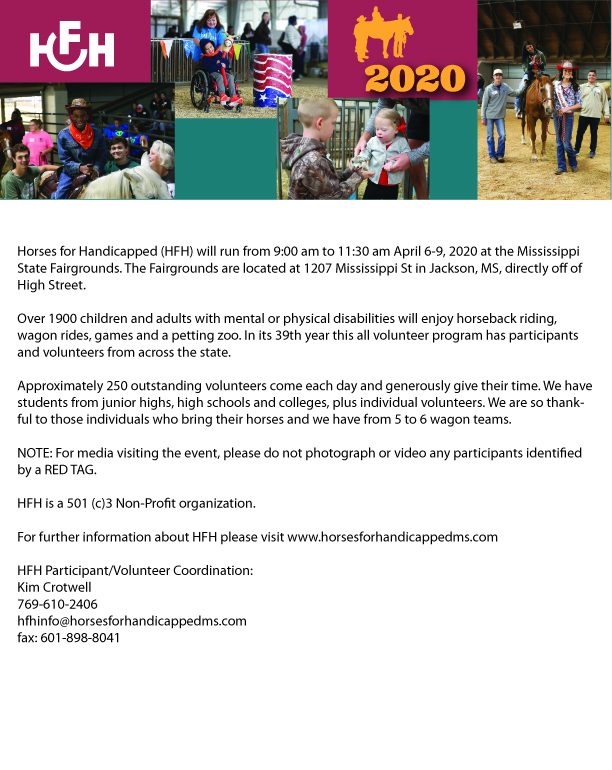 Horses for Handicapped was established in 1981 and takes place each April at the Mississippi Fairgrounds. The 4-day event provides horseback riding, wagon rides and activities to nearly 1,900 children and adults with disabilities. This all volunteer program which will celebrate its 38th year in 2019, reaches across the state of Mississippi in rider participation and volunteers. Participants from over 30 counties and 90 schools, development centers and regional centers come for a day of fun and activity. During the annual event, which also includes a petting zoo and games, between 225-250 outstanding volunteers come each day to make this special event happen. We have students from junior highs, high schools and colleges volunteer plus individual volunteers. We are dependent on volunteers and the dedicated horse men and women that provide the horses, wagon teams and run the riding and loading operations in the arena to make HFH happen. Participants have a day of fun, not only with their friends and classmates, but will also meet new people and friends. Being able to ride a horse or take a wagon ride makes a day at HFH a very special day. HFH continues to provide the unique blend of care and interaction of humans and animals to benefit children and adults with disabilities.